Objective. To provide physicians with a responsible assessment of bioelectrical impedance analysis (BIA) technology for body composition measurement. Participants. A non-Federal, nonadvocate, 13-member panel representing the fields of nutrition, pediatrics, surgery, public health, biomedical engineering, epidemiology, and biostatistics. In addition, 20 experts in nutrition, pediatrics, metabolism, biomedical engineering, physiology, and epidemiology presented data to the panel and a conferï¿½ence audience of 220. Evidence. The literature was searched through Medline and an extensive bibliography of reference was provided to the panel and the conference audience. Experts prepared abstracts with relevant citations from the literature. Scientific evidence was given precedence over clinical anecdotal experience. Assessment Process. The panel, answering predefined questions, developed their conclusions based on the scientific evidence presented in open forum and the scientific literature. The panel composed a draft statement that was read in its entirety and circulated to the experts and the audience for comment. Thereafter, the panel resolved conflictï¿½ing recommendations and released a revised statement at the end of the conference. The panel finalized the revisions within a few weeks after the conference. Conclusions. BIA provides a reliable estimate of total body water under most conditions. It can be a useful technique for body composiï¿½tion analysis in healthy individuals and in those with a number of chronic conditions such as mild-to-moderate obesity, diabetes mellitus, and other medical conditions in which major disturbances of water distribution are not prominent. BIA values are affected by numerous variables including body position, hydration status, consumption of food and beverages, ambient air and skin temperature, recent physical activity, and conducï¿½tance of the examining table. Reliable BIA requires standardization and control of these variables. A specific, well-defined procedure for performing routine BIA measurements is not practiced. Therefore, the panel recommends that a committee of appropriate scientific experts and instrument manufacturers be formed with the goal of setting instruï¿½ment standards and procedural methods. Bioelectrical impedance analysis (BIA) is a widely used method for estimating body composition. The technology is relatively simple, quick, and noninvasive. BIA is currently used in diverse settings, including private cliniciansï¿½ offices, health clubs, and hospitals, and across a spectrum of ages, body weights, and disease states. Despite a general public percepï¿½tion that BIA measures ï¿½body fat,ï¿½ the technology actually determines the electrical impedance of body tissues, which provides an estimate of total body water (TBW). Using values of TBW derived from BIA, one can then estimate fat-free mass (FFM) and body fat (adiposity). In addition to its use in estimating adiposity, BIA is beginning to be used in the estimation of body cell mass and TBW in a variety of clinical conditions. BIA measures the opposition of body tissues to the flow of a small (less than 1 mA) alternating current. Impedance is a function of two components (vectors): the resistance of the tissues themselves, and the additional opposition (reactance) due to the capacitance of membranes, tissue interfaces, and nonionic tissues. The measured resistance is approxï¿½imately equivalent to that of muscle tissue. Impedance measures vary with the frequency of the current used (typically 50 kHz, when a single frequency is used). Applications of BIA increasingly use multifrequency measurements, or a frequency spectrum, to evaluate differences in body composition caused by clinical and nutritional status. Many equations are available to estimate TBW and FFM as a function of impedance, weight, height, gender, and age. In actual use, however, BIA calculations of an individualï¿½s body fat may vary by as much as 10 percent of body weight because of differences in machines and methodï¿½ologies used. Equations and their variables differ, as does the choice of a reference method. There is a need for a consensus among experts on the appropriate conditions of use and appropriate applications of BIA. Because of the accessibility and widespread use of this technology, the NIH Office of Medical Applications of Research and the National Institute of Diabetes and Digestive and Kidney Diseases, along with the National Institute of Child Health and Human Development, the National Institute on Aging, the National Heart, Lung, and Blood Institute, and the United States Department of Agriculture, convened a technology assessment conference on December 12ï¿½14, 1994, to evaluate the validity and interpretation of data derived by BIA for the estimation of body comï¿½position. The conference brought together scientists with expertise in a variety of disciplines including nutrition, epidemiology, physiology, metabï¿½olism, biomedical engineering, and the clinical practice of medicine. The instrumentation for BIA, along with variations in techniques for its use, was examined in detail. Variables influencing the measurement of BIA and the need for standardization of testing conditions were considered. The applicability of BIA to a variety of conditions in both health and disease was examined. What does BIA measure in terms of electrical and biological parameters, and how safe is it? How should BIA be performed, and how can BIA measurements be standardized? How valid is the BIA technology in the estimation of total body water, fat-free mass, and adiposity? What are the appropriate clinical uses of BIA technology, and what are the limitations? What are the future directions for basic science, clinical research, and epidemiological evaluation of body composition measurements? Question 1: What does BIA measure in terms of electrical and biological parameters, and how safe is it? Precisely what BIA measures in terms of electrical and biological parameters is not known and probably varies somewhat from person to person. Instruments for BIA introduce into the body a known amount of current (I ), of about 800 ï¿½ A, most often at a frequency of 50 kHz. The current passes between two electrodes, often called the source and sink (or detector), and generates voltages between different points in the body volume according to Ohmï¿½s law. In present practice, the electrodes usually are located on the wrist and ankle. The current flows through all conductï¿½ing material present in the body in the path between the source and sink electrodes. Because living tissue constitutes a volume conductor, the physical carriers of the current are predominantly charged ions, such as sodium or potassium ions, which are able to move within the volume. Conductivity within such materials as blood and urine is high, that of muscle is intermediate, and that of such materials as bone, fat, or air is low. Current will flow predominantly through materials with higher conductivities. There is a lower resistance to current flow in regions where the conductor has a larger cross-sectional area, such as the body trunk, and a higher resistance in regions with a smaller cross-sectional area, such as the forearm. Finally, there is less resistance to current where there are fewer obstacles, such as cell membranes, that form barriers to charge movement. The actual parameter measured with BIA is the voltage (V ) that is produced between two electrodes located most often at sites near to, but different from, the sites where current is introduced. The measurement normally is expressed as a ratio, V/I, which is also called impedance (Z ). The measuring instrument is therefore called a bioelectrical impedance analyzer. Impedance has two components, resistance (R) and reactance (X ). In BIA the resistance is nominally about 250 Ω , and reactance is about 10 percent of that amount, so the magnitude of Z is similar to that of R. In many BIA reports, Z and R are used as if they are interchangeï¿½able, although Z = (R2 + X 2)1/2. In BIA measurements, ï¿½noiseï¿½ might arise from myoelectrical sources such as the leg muscles or possibly from outside interference from such sources as heaters. It is important to keep in mind that BIA measures only this end-to-end voltage across the entire path between the voltage-sensing elecï¿½trodes. This voltage is the energy expended per unit of charge for the total current path (e.g., the total path from wrist to ankle). As such, the voltage or impedance measurement does not provide any direct information with respect to the amount of current traveling through intracellular versus extracellular volumes, in blood versus muscle, or in fat versus fat-free media. Similarly, the measurement provides no direct information as to the length, areas, or volumes of the segï¿½ments of the body through which it passes. Relationships between impedance and other variables of interest such as TBW, FFM, or body fat have been established as statistical correlations with impedï¿½ance for a particular population rather than on a biophysical basis. Although such statistical relationships may be established and found to be useful for a particular well-defined group, they cannot be absoï¿½lute in view of the fact that the current diffuses throughout the conï¿½ducting volume and makes use of any and all conductive paths that are available in the specific person at the particular time of measurement. Because the current is greater in those paths with lower resistance, the paths will, in general, differ from person to person because of difï¿½ferences in body size, shape, electrolytes, fluid distribution, or other aspects of body composition, and will vary in the same person from time to time as these characteristics change. Almost any change in body size, shape, or composition will have at least a small effect on impedance. Although the current paths are not known from the BIA measureï¿½ments, plausible inferences can be made from known body structure. Much of the current will flow through the most highly conducting mateï¿½rials, such as fluids containing electrolytes. Relatively small percentages of change in the sizes or conductivities in fluid compartments will likely cause a significant change in the resulting impedance. Conversely, even large changes in the volume or conductivity of high-resistance regions, such as bone or fat, will not affect the BIA measurement very much. A limitation in interpretation for a particular subject is that the most significant paths are not known. Furthermore, because cross-sectional area is an important determinant of resistance, the overall resistance may be seen as a series combination of a number of shorter segments, such as arm, trunk, and leg. The overall resistance will be most affected by those segments of the current flow path that have the highest segï¿½ment resistance, that is, the arm and leg, rather than the trunk. The consequence is that sensitivity to changes in the conductive properties in the trunk will be less than the sensitivity to changes in the arm or leg. Explanations of the BIA method often begin with a discussion of a special, simplified volume that has a uniform cross-section, such as a cylinder, and that is filled with a homogeneous conducting material of resistivity (�). It is then observed that the end-to-end resistance (R) is the resistivity times the length (L), divided by the cross-sectional area (A) (i.e., R = �L/A). Multiplying the right side of the equation by L/L gives R = �L2/Vol, where Vol is the volume. Rearranging gives Vol = �L2/R, an equation that allows one to determine the volume, for this special case, if �, L, and R are measured. The major assumptions that underlie this simplified example and the resulting equation, namely uniform cross-sectional area and homogeneous conductivity, are not fulfilled in humans, not even approximately. Correspondingly, this equation as such is not used in BIA instruments, so no values for resistivity (�) are identified or used. Rather, the equation has been used by analogy to suggest a statistical parameter that can be used in humans, Ht2/R, where height (Ht) replaces length (L). This parameter is then used as one of the indeï¿½pendent variables in a statistical regression procedure, and its degree and form of association with some output of interest, such as TBW, are evaluated. In other words, as used with humans, the BIA measurement is not a direct measure of any biological output quantity of interest, such as fat, on the basis of a physical or biophysical model or reasonï¿½ing. Rather, resistance simply becomes one element of a statistical evaluation, and may or may not be found significant in relation to a particular output variable in a particular population. Discussions of BIA reports often include a discussion of ï¿½equations.ï¿½ These equations are those describing the statistical relationships found for a particular population and are not derived from biophysical reasonï¿½ing, although plausible arguments in their support are often provided. Because the impedance or resistance that is the product of the BIA measurement is affected by numerous physical and biophysical variï¿½ables, most of these populations are chosen to be similar in many of their attributes. This is done so that the BIA result then can be correï¿½lated with the remaining attributes that are allowed to vary. The conï¿½sequence is that each equation is useful only for subjects who closely match the reference population used in the original derivation of the equation. Users of the BIA procedure consider it safe because of several facï¿½tors. One factor is that currents at a frequency of 50 kHz are reported to be unlikely to stimulate electrically excitable tissues, such as nerves or cardiac muscle. Another is the absence of any reports of untoward events induced by BIA, even in the course of thousands of individuals undergoing measurement. A third factor is that relatively small curï¿½rent magnitudes are involved, less than 1 mA, which are less than the threshold of perception. Furthermore, the use of batteries or low-voltage power sources greatly diminishes risks from macroshock. At the same time, not all safety issues have been explicitly or formally evaluated, particularly issues that might arise when additional devices are involved (such as an implanted cardiac defibrillator) or in a hospital environment where electrical interference is more likely. In addition, so far as the panel is aware, there exist no formal safety standards for BIA instruments. Also, introduced current in the BIA procedure is larger in magnitude than are leakage currents allowed for some other medical devices, such as electrocardiograph machines (although that leakage involves the 60-Hz power-line frequency, which is thought to have more intrinsic risk). The panel neither heard nor identified any particular reason why the BIA measurement is other than safe. However, the panel thought that a more systematic assessment of all safety-related issues would be in order in view of the obvious public interest in this issue and because the panel was not advised of any comprehensive assessment that has presently been completed. Furthermore, a review of issues of electroï¿½magnetic compatibility may also be in order, in regard to both interï¿½ference with the BIA measurement and interference by the BIA measurement with other devices that might be in the vicinity. It is wise to advise anyone with an implanted defibrillator to avoid BIA evaluation until this issue has been reviewed, because even small currents could potentially provoke an incorrect defibrillator response. Question 2: How should BIA be performed, and how can BIA measurements be standardized? Standardization of the procedures used to obtain BIA measureï¿½ments is essential to provide meaningful estimates of TBW or fatness. In principle, BIA appears to have many advantages in collecting these body composition parameters. Measurement of impedance is precise, consistent, easy to obtain, portable, and relatively inexpensive. Howï¿½ever, variations in electrode position, electrode number, single versus multifrequency measurements, machine specifications, measurement protocols, and algorithms for interpretation may limit the validity of the data obtained using this technology. Digital readouts and computer software calculations and interpretations may give a false sense of data accuracy. Spot or foil electrodes, similar to those used for electrocardioï¿½graphy, must be carefully applied to the skin to ensure proper electrical conduction. Preparation of skin sites with alcohol prior to placement of electrodes has been recommended as well. Proper detector electrode placement is crucial for accurate and reproducible BIA measurements. The present convention is to place two distal current-introducing electrodes on the dorsal surfaces of the hand and foot proximal to the metacarpal phalangeal and metaï¿½tarsal phalangeal joints, respectively. In addition, two voltage-sensing electrodes are applied at the pisiform prominence of the wrist and between the medial and lateral malleoli of the ankle. A 1-cm displaceï¿½ment of electrodes can result in a 2-percent change in resistance. Data on the potential effects of contralateral and left-sided measurements, as well as other limb and torso electrode placements, are needed. Conï¿½trary to simple electrical models, the whole body does not behave like a conductor of uniform composition and thickness. The arm contributes approximately 4 percent of body weight but accounts for 45 percent of ï¿½whole-bodyï¿½ resistance, in contrast to the trunk, which contributes about 45 percent of body weight but accounts for 10 percent of ï¿½wholeï¿½bodyï¿½ resistance. Although some data are available on segmental measurements of the arm, leg, and trunk, more information is needed to determine whether additional electrode placement sites offer improvement over present examination techniques. Minimal specifications for BIA instruments should include source current, frequency, waveform, total impedance range over which the current is within a specified tolerance, and the dynamic range, resolution, and accuracy of the displayed impedance. The manufacturer should state whether the accuracy degrades with increased resistance. Instruments should report the primary resistance and reactance (if measured) at whatever frequencies these measurements are made. The total impedï¿½ance range over which current and the voltage-sensing circuit operate should conform to a particular tolerance (e.g., up to R = 1,000 Ω , X = 500 Ω at 1 percent). Calibration should be possible by a device that confirms accuracy of the BIA instrument, ï¿½ 1 percent, within the broad range of impedance expected for biological systems. Other variables that affect the validity, reproducibility, and preï¿½cision of the measurements include body position, hydration status, consumption of food or beverages, ambient air and skin temperature, recent physical activity, and conductance of the examination table. In addition, the accuracy of the determination of other measures that are used in the equations to predict TBW or fatness with BIA affect the accuracy of the estimate. Measurements are almost invariably made with the subject lying down. There is evidence that impedance values rise sharply within the first 10 minutes after the subject assumes the supine position and then continue to rise more gradually for up to 4 hours. Thus, standardization of conditions should include the length of time the subject is recumbent before the measurement is performed. Adduction or crossing of limbs short-circuits the electrical path and reduces the impedance. Therefore, it is recommended that the arms and legs be abducted at a 30ï¿½45 degree angle from the trunk. In subjects who are unable to separate the legs effectively, such as those with severe obesity, an insulating barrier (e.g., dry clothes) should be provided. Measurements obtained for several hours postprandial may be influenced by volume change. Some studies have shown impedance to decrease from 5 to 15 Ω over a 2- to 4-hour period. The changes can be controlled by obtaining BIA measurements after a fast of at least 4 hours. Length of the conductor is used for interpretation of impedance. Therefore, accurate measurement of the subjectï¿½s height is essential. Over- or underestimation of height by 2.5 cm has been shown to cause an error of 1.0 liters of TBW. Weight is commonly included in formulas used to estimate fat mass from BIA measurements, and thus it is imporï¿½tant that weight be measured accurately. Over- or underestimation of weight by 1 kg can cause an error of 0.2 liters of TBW. Thus, subjects should have stature measured to the nearest 0.5 cm and weight deterï¿½mined to the nearest 0.1 kg. Exercise can affect BIA measurements because of increased vasï¿½cular perfusion and warming of muscle tissue, increased cutaneous blood flow and vasodilatation, increased skin temperature and sweating, and sensible and insensible fluid losses. BIA measurements should not be performed within several hours of moderate-to-strenuous exercise, and the dehydration associated with physical activity should be completely corrected before the measurements are taken. Another variable that may be important in standardization is the menstrual cycle. The within-subjects variability of impedance measureï¿½ments is higher in women than in men and may reflect changes in hydration status related to the menstrual cycle. Little is known about the size of this effect on the impedance measurement. Equations must be used to convert the electrical measurement to an estimate of TBW or percentage of body fat. To permit assessï¿½ment of the primary data, as well as to allow local application of new or improved computational models where available, all instruments should report the directly measured resistance and reactance values. Optimally, to ensure the appropriateness of corresponding biological values derived from the basic physical measurements, computational algorithms and the characteristics of the validation population that are used to convert the fundamental electrical parameters to the instru-ment-reported biological ones should be provided with the instrument. Furthermore, it is imperative that the equations chosen to transform resistance and reactance to body water or body composition are approï¿½priate for the individual or population under study. In all cases, reported biological values should include an assessment of the precision of the individual (not the population) estimate based on propagated instruï¿½mental and measurement errors and on the statistical error limits of the computational algorithm. Question 3: How valid is the BIA technology in the estimation of total body water, fat-free mass, and adiposity? An often-cited basis for BIA states that the volume (Vol) of a cylinï¿½drical conductive object is related to its length and resistance by the expression,Vol = �L2/R, where L is the objectï¿½s length, R is resistance, and �is a resistivity constant. The electrical current passing through the body is primarily limited to electrolyte solutions; therefore, the only direct biological parameter measurable by BIA is related to the bodyï¿½s water content. At low frequencies (e.g., <1 kHz), cell membranes impede current flow through the intracellular space, whereas no such barriers limit extracellular current flow. However, at higher frequencies (e.g., >100 kHz), the signal penetrates cell membranes and passes through all fluids. Thus, in principle, it would appear possible to estimate TBW by modeling the body as comprising smaller components and then perï¿½forming a summation of water content over those components (limbs, trunk, etc.). Unfortunately, this approach, based only on biophysical principles, is beyond the scope of present BIA instruments. It is thus necessary to correlate whole-body BIA measurements to other measï¿½ures of TBW. TBW = a ï¿½ Ht2/R + b ï¿½ Wt + c. The standard error of the estimate of TBW by carefully performed BIA is generally less than 2 liters of water, or less than 4 percent error for a nominal 50 liters of TBW. It is commonly assumed that a 50-kHz signal penetrates cell memï¿½branes and freely passes through all fluids. Unfortunately, this assumpï¿½tion is known to be false; the current is carried by extracellular fluid plus some component of intracellular fluid. Furthermore, the human body is poorly approximated by the cylinder required by the relationï¿½ships outlined above, and the BIA measurement is disproportionately sensitive to limb versus trunk water content. For these reasons, it is apparent that the correlation between 50-kHz BIA resistance measureï¿½ments and isotopic dilution TBW differs slightly in conditions in which there are disturbances in the distribution of extracellular versus intraï¿½cellular water or limb versus trunk water. Thus, optimal accuracy in predicting TBW for a given subject will be achieved by using a prediction equation validated for subjects with overall body composition similar to that of the subject. There is no direct theoretical relationship between resistance and/or reactance and relative body fatness (percentage of body mass as fat). Estimation of adiposity from BIA therefore is based on empirical relationships in samples of experimental subjects and requires calculaï¿½tions involving assumptions at several steps. BIA most closely estimates body water, as has been discussed. The next step in the estimation of body composition is the estimation of FFM from TBW. Fat mass (FM) is then estimated as the difference between body weight and FFM, and relative body fat is calculated accordingly. Validation studies have been undertaken on a number of cohorts of healthy adults, with recent and more limited data available on neoï¿½nates, children, youth, and the elderly. Most of the studies relating BIA measures to a criterion method were conducted with White Euroï¿½pean or North American non-Hispanic White subjects. More limited data are available on Hispanics, non-Hispanic Blacks, Asians, and Native Americans. (1.1 g/cm3). Determination of FFM from TBW assumes a constant hydration level of FFM of 73 percent within and across individuals. Changes in body composition during growth, aging, disease, and obesity result in deviations from the assumed density and hydraï¿½tion of FFM used to derive the Siri equation.1 This observation has prompted some investigators to recommend that age-specific predictive equations be used for FFM; this issue remains controï¿½versial in light of the relative disadvantages for practical use of a proliferation of prediction equations. Clearly, disease and severe obesity result in body composition changes that render inapplicable the prediction equations that are derived from healthy adults of normal weight. In a variety of studies of healthy adults and children, the empirï¿½ical relationships among TBW, FFM, and percentage of body fat and BIA variables are significant, with lower predictive value and higher error terms in predicting percentage of body fat than predicting TBW or FFM. Validation and cross-validation studies predicting FFM derived by body density equations from BIA measures (usually Ht2/R) have usually resulted in prediction errors for young adults of 5 percent or less (coefficient of variation). These errors reflect the sum of the error of measurement of the criterion method, the (usually smaller) error in the BIA measurement, errors in measurement of height and weight, and errors attributable to the prediction equation. The larger errors occur in populations having a greater proportion of relatively fatter individuals. Errors may be substantially larger for individuals who differ from the reference populations. The impedance index Ht2/R has typically been the best single predictor of these body composition variables; inclusion of information on reactance and on body weight provides some improveï¿½ment in predictive ability. 1 Siri, W.E., Adv. Biol. Med. Phys. 1956, Vol. 4, pp. 239-280.
models that include TBW and total body mineral, in addition to body density, provide more accurate criterion estimates of FFM and therefore of percentage of body fat. This improvement is due to a reduction in the overall error in the prediction equation by reducing the error attributable to the criterion method. Ideally, prediction equations should be cross-validated on indepenï¿½dent samples or at least with statistically accepted techniques for splitï¿½ting samples for cross-validation purposes; thus far, a minority of studies in the published literature have provided cross-validation data. Body cell mass (BCM) represents the active metabolic component of the body and is thus an important component of body composition. An accurate assessment of BCM would provide the clinician with useï¿½ful information for nutritional management of patients. Although BIA is highly correlated with TBW, limited data are available to assess how well such data can estimate BCM. BCM consists of intracellular fluid and solids. Therefore, one would expect a high correlation of measures made by BIA. Data are limited, but suggest that BIA may have the potenï¿½tial to estimate BCM (in healthy adults). It is not clear whether reliable of BCM can be made in other population groups such as hospitalized patients or whether BIA can reliably detect changes in BCM. Because of widespread usage of BIA to estimate levels of adiposity in obesity, it is worth detailing the reasons why predictions of fatness in severely obese subjects using existing prediction equations must be viewed with caution. The geometric proportions of obese individuals compared with those of leaner individuals are such that a greater proï¿½portion of body mass and body water is accounted for by the trunk in relation to the extremities; the trunk, however, contributes a relatively minor amount to total body impedance. This situation would tend to result in overestimation of body fat using standard equations. If the assumptions of body density are used in the prediction equation, then body fat may be underestimated. The net effect in severely obese individuals is highly individual and generally unpredictable. Available information indicates that BIA is not useful in measuring acute changes in body fat in individuals, although it can characterize longer term changes in groups of subjects. Measuring change by definiï¿½tion produces a larger error term by virtue of dependence on two (rather than one) imperfect measures, the error from which may be additive. Among individuals at the extreme of leanness (5ï¿½6 percent body weight as fat), such as in some athletes and patients with wasting diseases, changes in the percentage of body fat may be less than the error of measurement. Although body fat patterning (e.g., hip vs. waist) relates more strongly to some health risks than does overall level of adiposity, conï¿½ventional BIA technology does not provide information on regional distribution or patterning of body fat. Investigations on segmental impedance (separately measuring impedance of the limbs and trunk) in order to estimate regional adiposity must be regarded as purely a research application at this time. In some individuals, the basic assumptions underlying the proï¿½cedure are not met sufficiently to render conventionally performed total body BIA appropriate as a measure of TBW and subsequent estimates of FFM and adiposity. These conditions include significant body asymmetry as in amputations, unilateral hemiparesis, and neuroï¿½muscular conditions that produce localized changes in perfusion or tissue atrophy. BIA should only be applied to these populations after appropriate validation. Question 4: What are the appropriate clinical uses of BIA technology and what are the limitations? Knowledge of body composition in health and disease is a continuing interest of clinicians, because components of the body often provide more useful information than do the whole-body measurements of weight, height, and the derived parameter, body mass index. An exponential increase in information over the past decade, as reflected in the number of publicaï¿½tions, attests to this mounting emphasis. BIA measures a property that depends on, or is at least covariant with, TBW. The appropriate comparï¿½isons are to other measures of TBW (18O, 2H, 3H) and methods used to derive the components of the two-compartment model of the body comï¿½position, FFM, and body fat, such as densitometry. Because BIA disproï¿½portionately considers the extremities, the relationship between impedï¿½ance and TBW must of necessity be an empirical relationship. This places an important constraint on the derived value: TBW must be altered in the torso and the extremities in a fixed relationship in health and disease in order to retain predictive value. This relationship probably exists in most normal subjects and in those with many mild disease perturbations such as mild-to-moderate obesity and noninflammatory disease such as diaï¿½betes and other chronic illnesses not producing local fluid accumulation. The relationship appears to be of value in early HIV infection to assess nutritional status. However, in conditions such as ascites, perhaps anaï¿½sarca and peripheral edema, during dialysis, and most importantly during critical illness characterized by inflammation such as multiple trauma, burns, or sepsis, the resultant disorder in water distribution generally invalidates the assumptions of bioelectrical impedance analysis. Thus prediction of TBW and the derived estimates of FFM and body fat using body impedance are potentially just as accurate as assessments of TBW using labeled water. When the other characteristics of ease of measurement, expense, safety, portability, and reproducibility are conï¿½sidered, BIA is often preferred over more logistically complex techniques such as TBW measurements or densitometry. The value of BIA in the estimation of body adiposity both on a cliniï¿½cal basis in the individual and epidemiologically in large groups to define the presence or prevalence of obesity, respectively, is of great interest. BIA appears to be a more accurate measure of FFM and percentage of body fat than body weight, height, or body mass index, and at little extra cost or difficulty but with somewhat greater complexity. BIA may proï¿½vide a more accurate measure of adiposity than do skin-fold measureï¿½ments and may be more easily standardized, although measurements of skin folds and girths may provide additional useful information on body fat patterning. Because of the wide availability of BIA instruments and their relative ease of use, there is concern that BIA measurements be performed in appropriate environments by personnel trained in both instrument use and interpretation of results. BIA does not appear to be useful to assess the composition of changes of weight consequent to dieting in the obese, presumably due to disproportionate loss of water over FFM. Similarly, acute changes in weight by infusion and acute loss by the development of protein calorie malnutrition do not appear to be reliably detected by BIA, partly because of lack of validity of the underï¿½lying assumptions and partly because of the insensitivity of the method to measure acute change. More gradual nutritional repletion may, howï¿½ever, be accurately assessed by BIA in malnourished patients who are not critically ill. There are uses for BIA in patients undergoing hemodialysis. One application is in the prescription and monitoring of the adequacy of dialysis, for which urea kinetic modeling has become the common standard. This model requires an accurate assessment of TBW, which can be provided by BIA. BIA can also be of value in assessing volume status in the dialysis patient in order to minimize common problems related to inaccurate volume determination. Knowledge of TBW might also serve to improve interpretation of drug pharmacokinetics, although the preliminary data have not confirmed this. In the hospital setting, particularly among the critically ill, the role of BIA has not been clearly defined. Disturbances of intracellular water are known to be characteristic of protein calorie malnutrition, and changes in TBW and the ratio of intracellular to extracellular water invariably occur subsequent to injury or inflammation. These two conï¿½ditions generally coexist in the critically ill. Thus direct or indirect measurements of TBW do not reliably reflect FFM. Unfortunately, this would likely invalidate the use of BIA to assess the response to parentï¿½eral and enteral nutrition in such patients, at least in terms of changes in FFM that reflect protein accretion. The potential of BIA to assess intracellular and extracellular water individually offers some future promise for this technique. There are clinical conditions for which knowledge of TBW may be helpful in monitoring critically ill patients, but the role of BIA in this assessment remains to be defined. Finally, there are many conditions in critical illness for which conï¿½ventional BIA is a poor measure of TBW. These would include ascites, anasarca, severe peripheral edema, and the massively overhydrated patient as well as other clinical conditions in which there are severe disturbances in water distribution. It appears, therefore, that bioelecï¿½trical impedance can be considered as only a research tool for the critiï¿½cally ill patient because the TBW-to-FFM ratio is variable and the body impedance-to-TBW ratio may often vary under these conditions. Although one would not wish to discourage investigation, there does not appear to be an established role for the technique in the critical care setting. Question 5: What are the future directions for basic science, clinical research, and epidemiological evaluation of body composition measurements? Future research directions of BIA may be categorized as to technology, basic science, clinical assessment, and epidemiological studies. There are more than 30 different manufacturers of bioimpedance machines worldwide. These manufacturers use different equations for converting the raw data of impedance or reactance to estimates of body composition. As a consequence, the same types of measurements have been extrapolated to widely different estimates of body composition in both lean and obese subjects. There has been difficulty in obtaining the actual equations incorporated into the software of the machines and the data from which these equations were derived. The availability of this information would help provide a more uniform application of BIA in research and clinical settings. Additional research is warranted to examine the relationships of the components of body composition among different technologies and to establish correlates of such body composition measures with health risk and other clinical or nutritional parameters. Some BIA reports, particularly more recent ones, use the reactance as well as the resistance components of impedance, incorporate measï¿½urements taken at multiple frequencies, or use measurements made at multiple sites or at sites other than the wrist and ankle. It is plausï¿½ible, although unproven, that reactance and changes with frequency are tied to intracellular versus extracellular fluid. No consensus has yet been reached as to the value of such procedures, which add comï¿½plexity as well as new information. Future research may show that the use of such information can tie BIA measurements more closely tothe underlying biophysical structure. An important need in the basic science of this technology is to investigate the biophysical pathways of the currents. The basic science underlying this technology is simple; however, application to humans involves a complex volume conductor shape, heterogeneous tissue types, extracellular and intracellular volumes, and changes over time. Thereï¿½fore, additional research that more completely and precisely links BIA measurements (either as currently used or with newer multifrequency, multisite forms) to the underlying physiological and biophysical structure will help to place BIA technology on a much stronger scientific basis. A major need in clinical research is the establishment of reference norms to improve data interpretation. These norms are needed in humans with and without disease across the life span. Further investigations are clearly needed in measuring different human somatotypes. For example, the disproportionate distribution of body weight in individuals with truncal obesity most likely affects impedance measurements. More research is needed to evaluate the possible diagnostic and treatment benefits of using BIA assessment of body composition to classify subï¿½types of obesity. There is little information on this topic. Moreover, BIA measurements in populations with varied ratios of extremity length and truncal size should provide valuable information on the contribution of different body parts to total BIA measurements. An important characteristic of BIA is its ability to estimate TBW. Recent studies suggest that measurements of TBW may be further refined to determine quantities and distributions of intracellular and extracellular water. It may be possible to differentiate between extraï¿½cellular and intracellular water by combining BIA measurements at low frequency with those at high frequency. In addition to measuring resistance, BIA instruments also provide a measurement of reactance. Although the biophysical significance of reactance is poorly underï¿½stood, it appears to relate to the extracellular/intracellular water ratio. The potential to differentiate between extracellular and intraï¿½cellular water in various pathophysiologic conditions is an exciting potential application for BIA awaiting future development. Measureï¿½ments of the distribution of body water, in addition to its amount, would be of potential value to clinicians when managing fluid requireï¿½ments in patients with critical illness, renal and liver disease, and cardiac failure. Conventional BIA technology does not provide information on regional distribution or patterning of body fat, a variable that has been shown to relate more strongly to some health risks than does overall level of adiposity. Investigations on segmental impedance (separately measuring impedance of the limbs and trunk) must be regarded as a purely research application at this time, but studies should be conducted to determine the value of BIA in the assessment of body fat patterning. Additional studies are needed to determine whether population-specific equations may be needed to predict adiposity in the elderly, the very lean, and the obese as well as to determine whether racial/ ethnic backgrounds affect the validity of predictions. Given that the prevalence of obesity is higher in Hispanics, Native Americans, and non-Hispanic Blacks than in the non-Hispanic White populaï¿½tions on whom most of the prediction equations have been develï¿½oped, one might expect poorer predictive value for these ethnic minority populations. To be of maximum value, studies should include the more complex (multifrequency) impedance measureï¿½ments, multicomponent criterion methods accounting for TBW and total body mineral as well as body density, and statistically accepted cross-validation methods. Ideally, cross-validation should take place on independent samples. The existing archival data from the National Health and Nutriï¿½tion Examination Survey (NHANES III) that was conducted between 1988 and 1994 includes more than 16,000 measurements by BIA in a nationally representative sample of noninstitutionalized civilians in the United States who are 12 years of age or older. Resistance and reactance data from the survey are included in the NHANES III dataï¿½base, along with anthropometric data on weight, height, extremity circumferences, diameters, and skin-fold thicknesses. At a minimum, the BIA data, height, and weight can be applied in equations to estiï¿½mate TBW. Additional anthropometric information and other clinical variables might be used to improve estimates of TBW if valid prediction equations are developed for specific demographic subgroups. Additional validation studies using multicompartment models to test how well BIA-derived estimates of TBW predict FFM and adiposity are needed. Data presented to the panel from the Framingham Heart Study and the Framï¿½ingham Offspring Study provided some validation of BIA methodologies for body composition assessment in elderly men and women. The NHANES III includes non-Hispanic White, non-Hispanic Black, and Mexican-American men and women in adequate numbers to allow the development of nationally representative normative data on body composition for the U.S. population. NHANES III BIA data are potenï¿½tially extremely useful to examine the relation of body composition estimates from this technique to clinical risk factors such as blood pressure, blood lipids, and glucose intolerance. This will determine, in part, whether BIA provides additional information on disease risks compared with other techniques of body composition assessment. The availability of longitudinal followup of the NHANES III cohort would provide valuable information relating body composition derived from BIA to clinical outcome. It is possible that BIA measurements may corï¿½relate positively with adverse clinical outcomes. BIA estimates of body composition should be directly compared with other field techniques of body composition such as skin-fold thickï¿½nesses and other anthropometric measurements. Data on the validity of BIA measurements performed in settings such as cliniciansï¿½ offices and health clubs would provide valuable information on the effective applications of this technology in nonresearch settings. 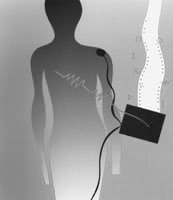 BIA-applied currents flow throughout all conducting tissue within the body and thereby do not uniquely reflect the properties of any single tissue, compartment, or region. BIA measurements are linked with output variables such as TBW or body fat through statistical association rather than on the basis of biophysical principles. A systematic evaluation of some safety considerations is warranted, especially as related to implanted defibrillators. BIA values are affected by numerous variables including body posiï¿½tion, hydration status, consumption of food and beverages, ambient air and skin temperature, recent physical activity, and conductance of the examining table. Reliable BIA requires standardization and control of these variables. A specific, well-defined procedure for performing routine BIA measurements is not practiced. Therefore, the panel recommends that a committee of appropriate scientific experts and instrument manufacturers be formed with the goal of setting instrument standards and procedural methods. Instruments used for BIA should provide electrical specifications and calibration verifications that confirm a measurement accuracy within ï¿½ 1 percent over the broad range of resistance expected for biological systems. The instrument should report the primary resisï¿½tance and, if measured, reactance values and the frequency(s) at which these measurements were made. Calculations of body composition parameters from the basic elecï¿½trical measurements should include population-specific equations and report the standard errors of the estimate for the individual. BIA provides a reliable estimate of TBW under most conditions. Subsequent estimation of FFM and the percentage of body fat vary in validity depending on the population or individual studied and on the applicability of the prediction equation used to estimate these parameters of body composition. BIA can be a useful technique for body composition analysis in healthy individuals and in those with a number of chronic condiï¿½tions such as mild-to-moderate obesity, diabetes mellitus, and other medical conditions in which major disturbances of water distribuï¿½tion are not prominent. The ability of BIA to accurately predict adiposity in severely obese individuals is limited. In addition, BIA is not useful in measuring short-term changes in body composition (i.e., in response to diet or exercise) among individuals. Although there may be instances in critical illness for which TBW assessment by BIA may be useful, such as in the dialysis patient, there does not appear to be an established role for the technique in the critical care setting. Further research is recommended in BIA technology, the basic science of impedance measurements, determinations of intra-and extracellular water, correlations with clinical outcome in specific patient populations, and longitudinal clinical followup of the NHANES III subjects. Bruce Ryan Bistrian, M.D., Ph.D.
Steven N. Blair, P.E.D., F.A.C.S.M. Melvin D. Gerald, M.D., M.P.H. Donna H. Mueller, Ph.D., R.D. "Mechanical and Physiological Modifiers of Bioelectrical Impedance Analysis Measurements"
"Why Bioelectrical Impedance Analysis Should Not Be Used for Estimating Adiposity"
"Whole-Body Impedance: What Does It Measure?" "Use of Statistical Methods to Best Estimate Body Composition or Adiposity"
"Use of Bioelectrical Impedance Analysis Measurements in the Private Clinician's Office"
"Techniques Used in the Measurement of Body Composition"
"Overview of Bioelectrical Impedance Analysis Measurements for the Estimation of Body Cell Mass and Total Body Water"
"Use of Bioelectrical Impedance Analysis Measurements as Predictors of Performance"
Linda B. Houtkooper, Ph.D., R.D. "Why Bioelectrical Impedance Analysis Should Be Used for Estimating Adiposity"
Danny O. Jacobs, M.D., M.P.H. "Use of Bioelectrical Impedance Analysis Measurements in the Clinical Management of Critical Illness"
"Use of Bioelectrical Impedance Analysis Measurements in the Clinical Management of Patients With AIDS or the Wasting Syndrome"
Robert J. Kuczmarski, Dr.P.H., R.D. "Use of Bioelectrical Impedance Analysis Measurements as Part of a National Nutrition Survey"
"Clinical Characteristics Influencing Bioelectrical Impedance Analysis Measurements"
"Use of Bioelectrical Impedance Analysis Measurements in the Clinical Management of Patients Undergoing Dialysis"
Lawrence A. Leiter, M.D., F.R.C.P.(C. ), F.A.C.P. "Use of Bioelectrical Impedance Analysis Measurements in Patients With Diabetes"
"Biological Parameters Considered in the Derivation of the Bioelectrical Impedance Analysis"
"Overview of Bioelectrical Impedance Analyzers"
"Use of Bioelectrical Impedance Analysis Measurements in the Clinical Management of Malnutrition"
Ronenn Roubenoff, M.D., M.H.S., F.A.C.P. "Use of Bioelectrical Impedance Analysis Measurements in a Prospective Epidemiological Study"
"Use of Bioelectrical Impedance Analysis Measurements in the Clinical Evaluation of Patients With Liver Disease"
"Use of Bioelectrical Impedance Analysis Measurements as an Evaluation for Participating in Sports"
Barbara J. Zarowitz, Pharm.D., F.C.C.P. "Use of Bioelectrical Impedance Analysis Measurements in Association With Pharmacokinetics"